Be very, very careful with that setup, Ryan. 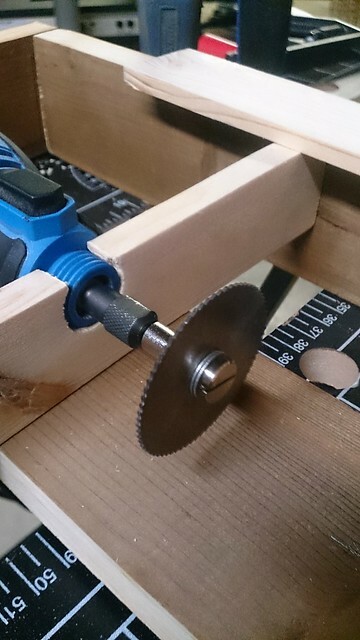 The smallest amount of play in the motor bearings will cause the blade to wobble a tiny amount, grab the wood you are trying to cut, and pull your fingers toward the blade. Ask me how I know this. I would suggest making a simple guard that would fit over the blade and protect your fingers. Trying to re-create a part of south-central Pennsylvania in 1956, one small bit at a time. I'm considering building some sort of sled or jig to hold the stock while I make the cuts. That being said the results so far are very promising. Found one of my steel G strings to test out the Tomytec bus mechanism. Probably going to need a bigger one to work on something heavier than a piece of paper. So you're a female robot that likes to go to the beach and tease R2D2 till he sparks ! 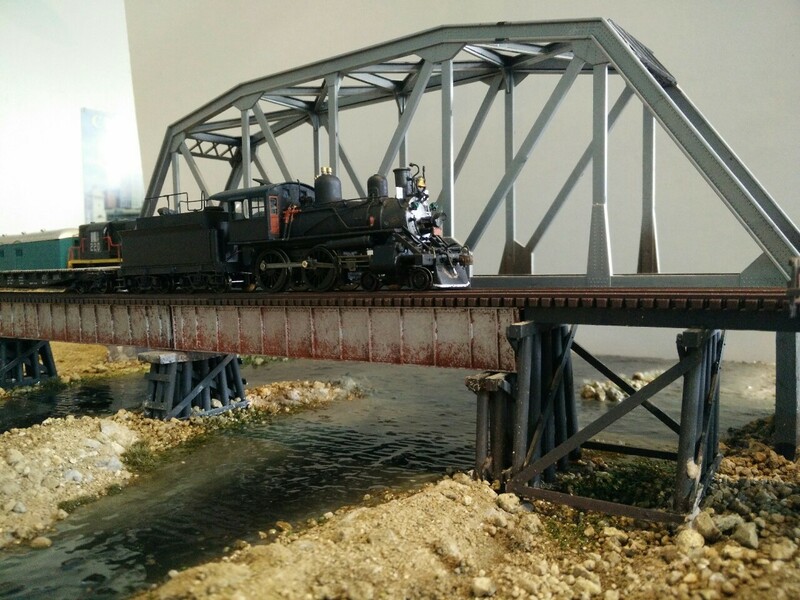 Last week, I painted and poured my river, and today, I reinstalled the bridges! I put a first layer of water down on the layouts "river"
You guys wet spots came out looking ........ wet . Well done . Been working on a bridge for my CV. Always liked this shot and decided to build it. 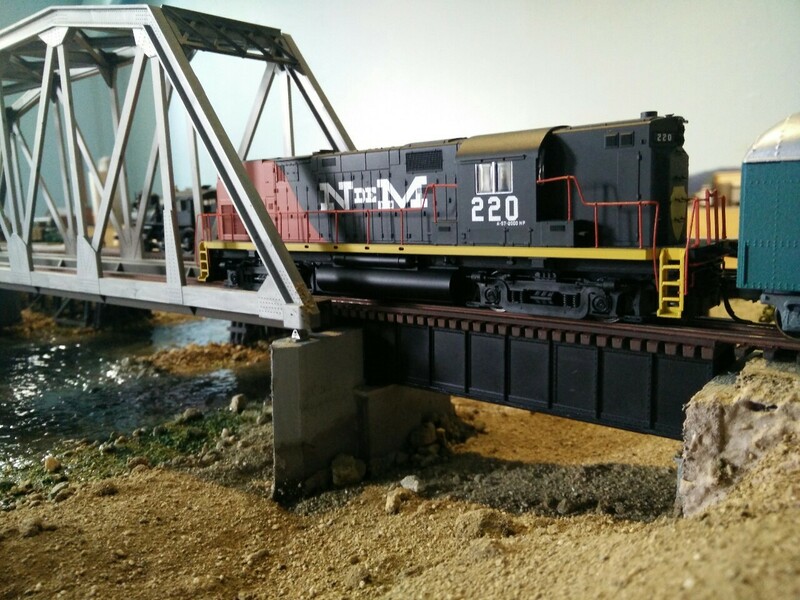 The decals were done by Highball Graphics and the bridge is a modified Micro Engineering bridge. 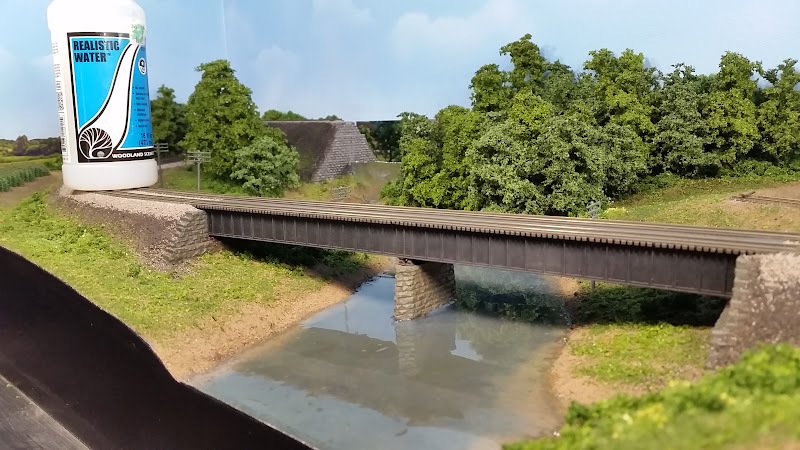 Still need to build the abutments ballast the deck and do some weathering of the bridge but not the beam with the slogan. That will be left freshly painted. Utz can get cooking oil delivered now. Here is Procor #75006, in between two MT decorated models, which is in a series that I found is used for vegetable oil most of the time. Still have some decals to finish and shot of dull coat. Wish Microscale would have an enlargement of the decal sheet so you know what you're cutting, especially in white. 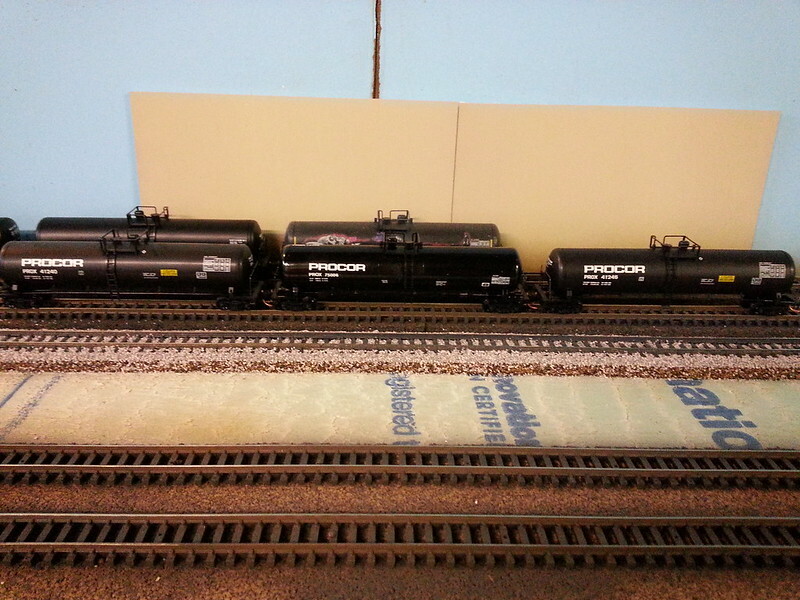 In doing my painting and decal work, I'm finding I need some "Hydrogen Peroxide" decals for my white PROCOR tank cars. Anyone printing decals at the time that could throw some of these on their sheet to fill it out ? Or if someone happens to have MicroScale #60-1236 Data Tank Car Lading Stencils, is Hydrogen Peroxide listed on there somewhere ? 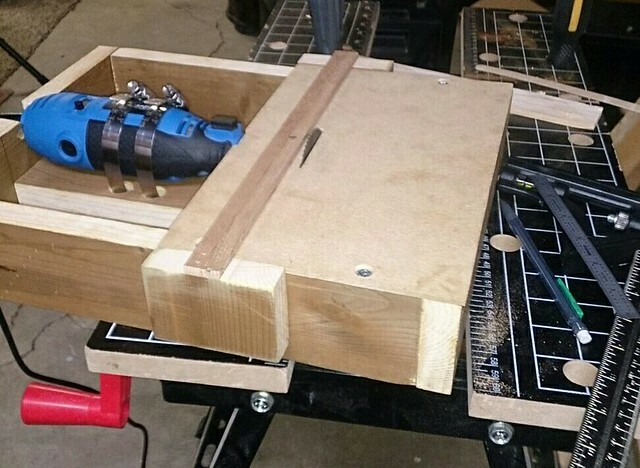 I have been contemplating making this type of micro-table-saw. The new Dremels (well, ones made in the last 20 years or so) have ball bearings with pretty much no play in them. I really like that top shot. three fingers hitting the wall of his shop. BE VERY,VERY careful!! 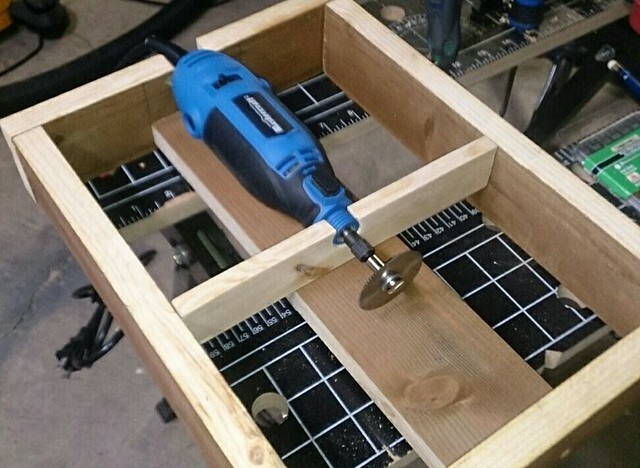 I had a table saw kick back on me once when I was learning how to use it, and now I try to do everything that I can to keep that from ever happening again. Sometimes it's hard to appreciate how strong these power tools are, even the small ones. Also, don't forget the eye protection.